Germinating the marijuana seeds properly will help in ensuring the success of any pot growing project. Seeds must be prepared so they can easily sprout. 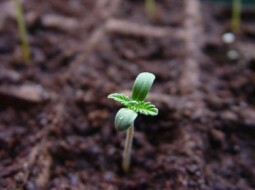 A high percentage of germination rate can be expected if the ganja seeds are well prepared. Proper seed selection is also of great importance. Choose to germinate mature seeds and not those lightly colored ones. 1. Pre-soak the pot seeds by putting them in a small container containing distilled water without adding any components for about 18 hours to 24 hours. 2. After pre-soaking, transfer the marijuana seeds to paper towels that are moistened and pre-warmed to room temperature. 3. Do not let the paper towels dry out. Always ensure that the paper towels are damp for best results. Mist the paper towels daily but do not put too much water to avoid mold growth. 1. Paper towels can get cold easily. Do not let them get too cold by keeping them in a warm and dark area. A temperature of about 78 to 80 degrees Fahrenheit should be maintained through the entire germination process. The use of a heating pad may be necessary. 2. Do the process of scarification to expose a little opening along the edge of the marijuana seeds. Scarification is done by gripping the pot seeds with the ridge side up between your thumb and forefinger. Gently scrape across the ridge. 3. Be extra careful not to squeeze the pot seeds during scarification. 4. Once the germination process has been started, never touch the marijuana seeds with your hands. Always use tweezers to avoid contamination. 5. Maintain the right level of temperature on the area where seeds are germinated. You can use a digital temperature gauge so you can also check how warm the paper towels are. It is easier to germinate cannabis seeds that have been sacrificed and pre-soaked. Follow the steps on how to prepare the seeds and take note of the things you should avoid doing while the seeds are being germinated. In approximately 48 hours of germination, you should see a crack on the seeds. Once the seeds have fully sprouted, you can already transfer them in your chosen medium but make sure to handle them with care because they are very delicate during this stage.